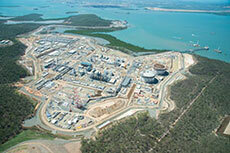 Santos announced today that the PNG LNG project has started producing LNG ahead of schedule. Production from the first LNG train will increase over coming weeks and the first cargo is expected to be shipped to Asian markets before mid-year. Work on the second train is also progressing and it is anticipated that LNG production from this unit will start in the next few weeks. David Knox, Santos Managing Director, said that first LNG production from the PNG LNG project represented a significant milestone, following first condensate production in late March. "I congratulate our operator ExxonMobil on the successful delivery of this major milestone ahead of schedule. We look forward to the continued ramp up of LNG production until the first cargo is ready to be loaded in the coming weeks." Mr. Knox said that delivery of the PNG project was a crucial step in Santos’ plans to become a supplier of LNG to Asian markets. 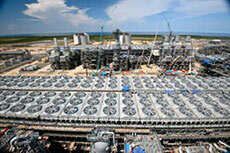 "PNG LNG will quadruple Santos’ LNG production once the project reaches full output," he said. "Our GLNG project also continues to make good progress and remains on track for first LNG next year, within the current budget." Sanctioned in December 2009, the US$19 billion PNG LNG project includes the development of gas production and processing facilities in the Hela, Southern Highlands and Western Provinces of Papua New Guinea, over 700 km of pipelines and a two-train LNG processing and loading facility with a capacity of 6.9 million tpa located near Port Moresby. Earlier this month, Santos released its first quarter 2014 activities report, which showed higher first quarter production and sales revenue, as well as progress on major LNG projects. 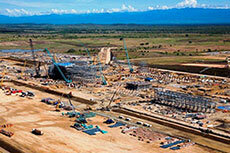 Oil Search has said that the PNG LNG project is progressing a few months ahead of schedule, with first cargo deliveries expected in mid 2014. Santos has reported a 28% increase in sales revenue for the first quarter 2014. ExxonMobil’s Papua New Guinea LNG project is months ahead of schedule as first delivery to Asia is on track to take place this summer. Oil Search has released its full year 2013 results, highlighting that the PNG LNG project is now 95% complete.